I couldn’t decide whether to make a boy version or a girl version of this one…so I made both. 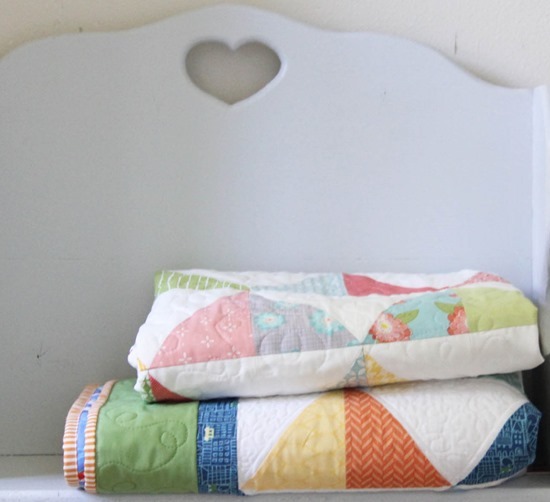 The pattern comes in 3 sizes, crib, throw, or twin…the crib size doesn’t have borders. It uses fat quarters, scrap rectangles, or 10″ -precut squares (Layer Cakes)…and no templates. The girl version I quilted all over with loops. The boy version I did straight line quilting first, outlining the triangles, then I went back and did small-ish meandering on the white triangles. The borders got some loopty-loops…but I left the print triangles un-quilted…it makes them really pop! 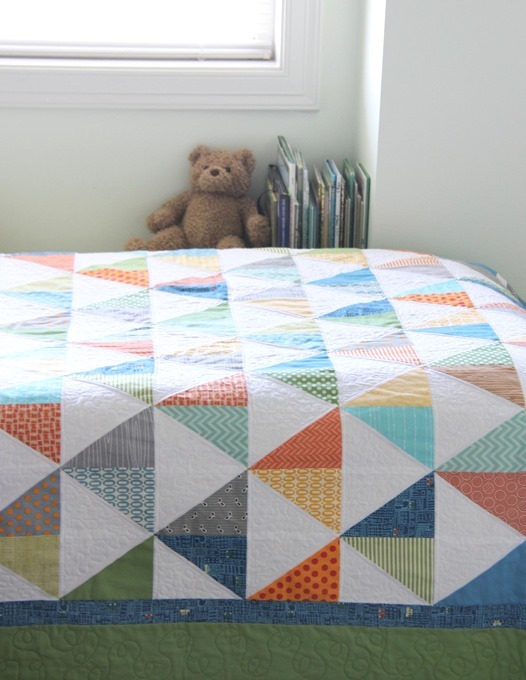 These were really fun quilts to make…I see many more of them in my future! You can find this pattern in my shop. Happy Quilting! Such a nice piece! It has been so long since I have quilted, this def. gives me the inspiration to pick it up again! Love both versions!! 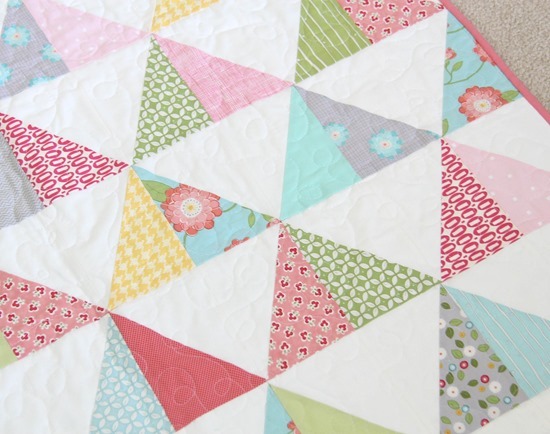 Beautiful quilting too! Thanks for sharing. Very nice and colorful. I really like those triangles in all those different colors. I really love this pattern!! Gorgeous! I love this pattern, so many colour possibilities! I just ordered your book! I can't wait to read about how you manage your time. I have three kiddos too and sometimes I am so tired at night, which is usually my only time to sew. If only any of them had napped past 18 months I would have had time during the day, but unfortunately all of them have inherited my husband's proclivity for less sleep than normal. Not me, I need my 8 hours! 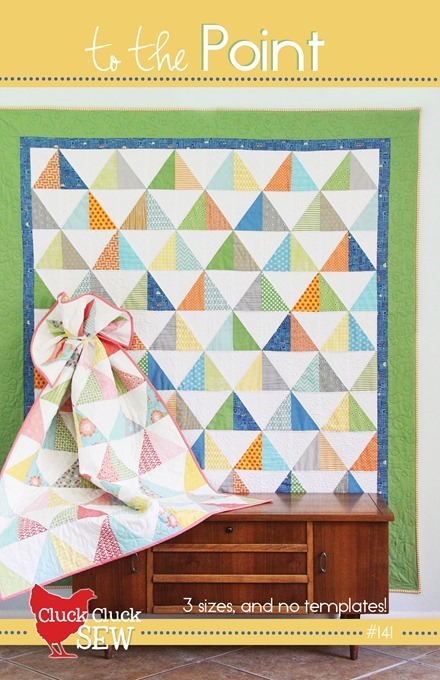 I've been looking for a triangle pattern that doesn't require a triangle ruler. I'm new to quilting and don't have a ton of equipment. But I do have Woodland Pals fabric which will be perfect for my little boy with this pattern. Love the pattern! It's gorgeous. I bought Wallflowers and Dixie yesterday. Now just to decide on the fabric! 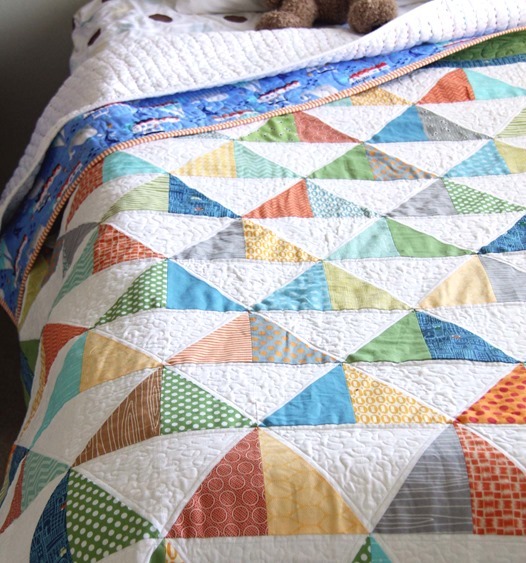 Thank you so much for showing these gorgeous quilts and telling how you quilted them. 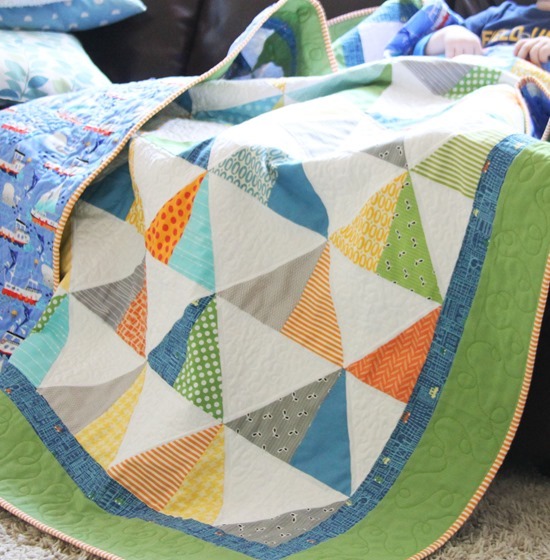 I can see how the colored triangles truly do POP on the boys quilt! Wonderful! Love the white, and then the triangles of colour. Brings a feeling of peace to the quilt. I am envious of your productivity, though. ;) Keep up the good work. This is my favourite new pattern, thanks! I love this! What fabric is the green in the border? It sets off the other colors in the quilt. Just beautiful. Sandy that green is a Bella Solid I think in Grass?? It's a really pretty green and I use it all the time! 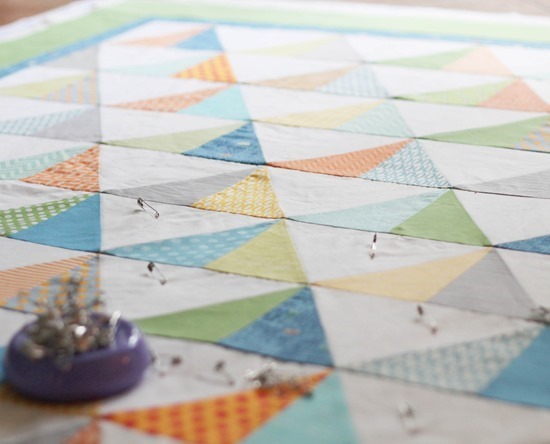 Love these quilts! Great pattern!